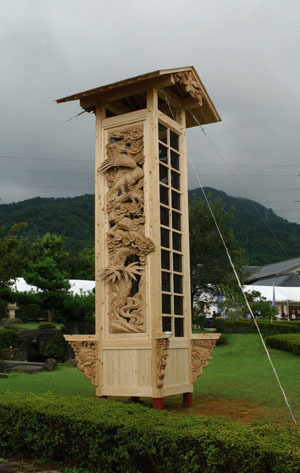 This is a traditional symbol of Inami carving . We arranged this design of animals and flowers (pine, bamboo, ume tree, perony, tortoise, eagle, magpie) and it represents Japanese particular scenery. We devote "Yaotome-hime-no-mikoto" and "Inami-takumi-no-kami" on the crane symbolizing love and peace. This is "Tower of flowers and animals" , symbol of Inami sculpture which we combined　5.35 meters long 1 meter wide panels.